A redesigned edition of Magento 2 Custom Product Designer has arrived! At Aitoc, we focus on continuous improvement and evolvement to stay on the edge of innovation and deliver comprehensive, highly effective solutions to our customers. 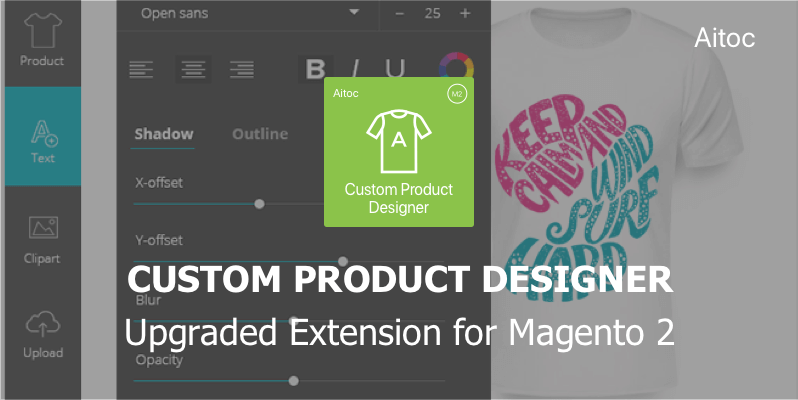 With that in mind, we have completely upgraded the user interface of Magento 2 Custom Product Designer, one of our most popular extensions allowing buyers to personalize items at online stores all by themselves. A great user interface and ease of use are amongst the most important aspects affecting customer’s satisfaction with a store’s services. 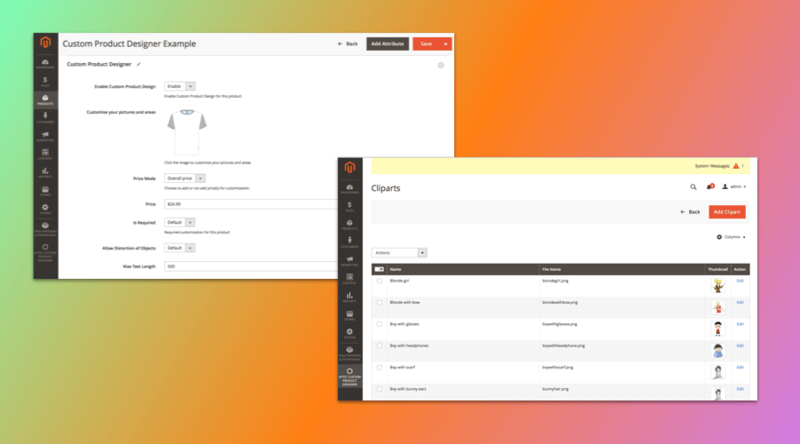 For the new Custom Product Designer, we created a simple and sleek, yet modern and visually appealing UI design that adheres to the best usability practices. We have upgraded the front-end part of the solution aiming to provide an enhanced user experience for every buyer. Now, your potential customers will take pleasure from designing new products, the same will do Magento administrators when configuring the system. Format text objects by changing their color, font, size, etc. Product Personalization: Do I as an Online Retailer Even Need It? Product personalization has become extremely popular today, allowing store owners to attract demanding customers and increase average purchase size. A research by Deloitte supports this fact by stating that people expect the opportunity to fine-tune services and products they are offered. Moreover, another study says that consumers agree that personalization has an impact on what they purchase. So the answer is short: because your rivals either have already embraced the technology to enable their clients to personalize their products or plan to do so in the nearest future. You want to keep up with the times, too, don’t you? If you are still on the fence, here are the reasons that will convince you. Stay up-to-date. People love new things, and they tend to go to town on using them. And in the ecommerce universe, the winners are those stores that blaze a trail in the field of technology by offering new and personalized experiences to their users. Now it’s a perfect time to join the race for clients by furnishing them with product personalization. Stores that will shortly get on the bandwagon will also grab a piece of this pie. Increase customer loyalty. The number of ecommerce stores is immense, and when it comes to choosing between two stores that sell similar products at the same price shoppers are likely to select the one that offers a more engaging user experience. E-businesses can jump at the chance that product personalization creates. By adding this feature to their stores they will be able to give customers exactly what they want. It means that their clients will have a reason to shop in their store and come back. Streamline customers’ decision-making process. Time is priceless for ecommerce business owners, and they can’t afford to wait for the client’s decision for many days or weeks. Yet, if potential buyers need a personalized product it may take a long time to figure out what they look for and make sure that no tiny details are missing. Save Your Money. When you enter into a negotiation with a customer on what he/she wants to personalize in your product you never know how much money you will lose if you two don’t reach an agreement. In short, your employees responsible for such personalization services will lose their time, and you will lose your money. So you have to pay them for arranging the deal that may never take place. No matter whose fault it was that the client chose your competitor’s store, your employees will get paid anyway. And it means unavoidable costs for you. 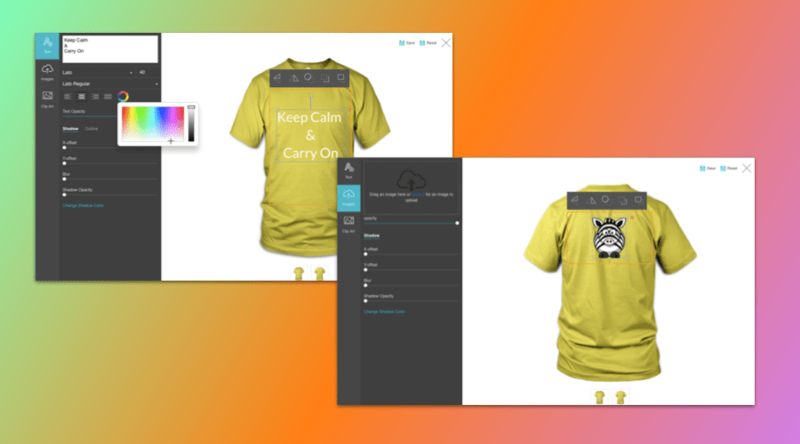 By installing a tool to give free rein to store visitors with personalizing items you pay only once and get clients’ satisfaction for a long time to come. Sounds attractive, doesn’t it? 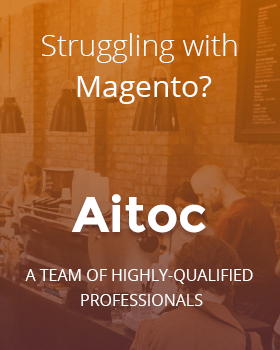 So, do you have any more doubts whether you need the new Magento 2 Custom Product Designer at you store? Leverage this extension to offer your clients an unforgettable shopping experience. Allow them to be designers and turn you default prints into custom advertising specialties and corporate items with Custom Product Designer. For any questions, please write us at sales@aitoc.com . We will gladly assist you!